It is a scandal that black Americans are inanely guilt-tripped into voting for pitiable, odious presidential candidates under the intellectually flimsy pretense that not doing so is a colossal betrayal of the many black people who “died for black suffrage.” This is not only transparent poppycock, but it is also an immoral twisting of the historical record. Those who push this line of argument operate under the pretense that attaining the right to vote is akin to climbing Everest — a task of mammoth proportions that only the most fastidious and disciplined of athletes can accomplish. The reason why black suffrage was only realized by the Voting Rights Act of 1965 is because American racists presented relentless obstacles to it. Is the right to vote a fundamentally good thing that should be exercised with caution? Certainly. However, the assertion that blacks in America “died for the right to vote” is casuistic drivel. Black people died because racists refused to accept their humanity and ultimately killed them. It is a statement of historical fact that voting was an infinitesimally small part of that denial of black humanity in America. To fail to comprehend, or to deliberately ignore, this bigger picture of American anti-blackness is unacceptably dehumanizing. The right to vote is not an Olympic gold medal. There is no training required to achieve it. The right to vote did not have to be an issue that comprises a massive part of black American identity. It is that way because white racists made it so. The right to vote includes the right not to vote. Just as the right of blacks to drive cars does not mean that blacks must turn their cars into Uber vehicles for any person who needs a free ride, the right to vote does not mean that voting is mandatory. Rights do not eradicate choice or constrain freedom. Rights support choice and freedom. Responsible voters choose when to exercise their right to vote on the basis of the availability of acceptable candidates. Black ancestors would not support voting for anti-black agendas just because suffrage was something they were denied. In this 2016 election, the two main options are either a man who was sued by the federal government for engaging in housing discrimination against black Americans, or a woman who has trafficked in anti-black rhetoric for her whole political career — most notably characterizing young blacks on the wrong side of the criminal justice system as “superpredators.” To make the argument that one’s blackness is predicated on picking between these two demonstrably anti-black candidates is not a position that can be plausibly defended. The perverse way voting is treated like a moral obligation for blacks would be less offensive if other groups were routinely held to the same standard. This is not the case. It is also vital to note that having unpredictable voting patterns can lead to far more group political power than constantly voting reliably for one party every four years. For this reason, the phrase “white swing voters” makes sense to the ear, whereas the phrase “black swing voters” sounds almost comical in the American context. If, going forward, blacks sit out of elections when there are no candidates that meet a variety of black political needs, it would encourage more candidates to take blacks seriously as a voting bloc, rather than just a group to bestow imbecilic blandishments upon every election cycle without ever engaging in any real policy action. The consistent fetishizing of voting is something that is done to distract the black community from the bigger picture of economics. For decades since the passage of the Voting Rights Act of 1965, blacks have been hoodwinked into believing the elaborate scam that social progress is accomplished by pulling the lever for corrupt political candidates, as opposed to the acquisition of knowledge, skills, and capital. The same insipid people who repeat the hackneyed “Vote because black ancestors died for the right to do so!” bromide never mention anything about group economics and self-empowerment. Black advancement in America will continue to be a struggle so long as the black community continues to look to politics to be a panacea. The solutions to black problems in America lie in knowledge acquisition and economic empowerment. The nonsensical elevation of politics over knowledge and economics explains why congressman John Lewis is, albeit justly, treated as an American hero, meanwhile Dr. Thomas Sowell is afforded little respect and even fewer people mention Dr. Carter G. Woodson’s name. The only obligation of a responsible citizen is to remain informed about the political issues and political candidates. Voting should only occur after acquiring information and seeing a candidate that best represents one’s political and moral worldview. 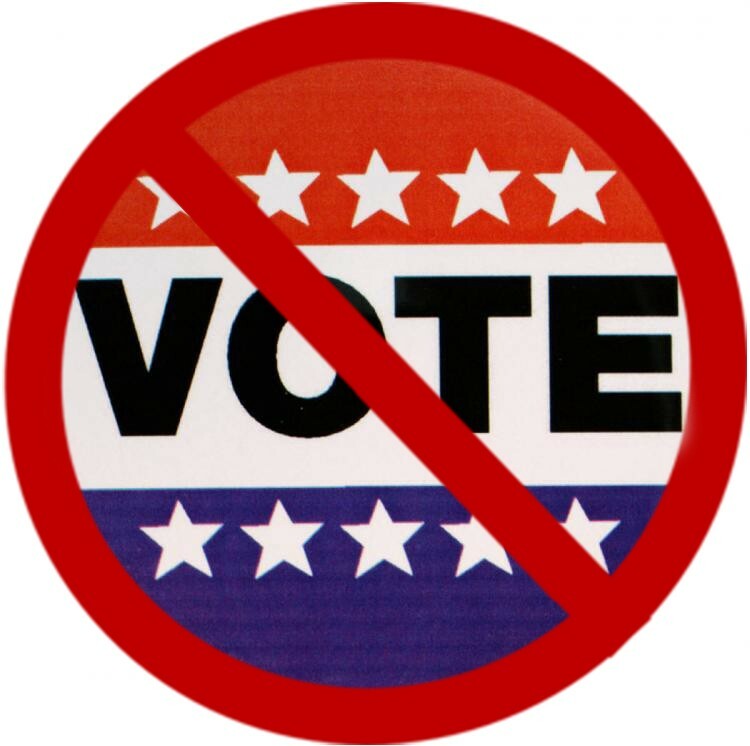 If being completely oblivious to the political process is the reason people do not vote, the argument could be made that such a situation is damaging to a democratic society in the long run. However, the idea that being black in America makes voting a necessity is intolerable hokum, and it is especially absurdist when data points can be provided to show that the two candidates for president of both major parties are decidedly anti-black. Inasmuch as the anti-black histories of Hillary Clinton and Donald Trump render them unacceptable candidates, “none of the above” is the most prudent answer to the Clinton v. Trump electoral question this year.